It is almost time for Cinco. If you are a Mexican living in the US and you want to get attention, if you want to make some noise, if you feel that you have something good to share or say: Cinco de Mayo is your day! My first cooking demo: Foods from Puebla during Cinco. The first time I got invited to cook on TV: Chicken Tinga for Cinco. My first radio interview: Do Mexicans celebrate Cinco? The biggest sales day for my first cookbook: Cinco. The day I was honored to be invited as guest chef to cook at the White House: You guessed it, Cinco! Heck: you aren’t Mexican and hoping for an opportunity? Wait for Cinco anyway. The funny thing is, in Mexico, Cinco de Mayo is a local celebration mainly in the city of Puebla, where a small Mexican militia beat a large French army in 1862. The French won right back and it took a few years for Mexico to shake itself off from an imposed European Monarchy. Cinco is not a national holiday. There aren’t fiestas throughout the country that day. There isn’t Mariachi music on every corner. No margaritas generously poured in the middle afternoon specifically on that day. We don’t dress Mexican, partly because we are Mexicans every single day of the year, but mostly, because when we dress ourselves in the color of the Mexican flag it is either for Mexican Independence Day -September 16- or when Mexico is playing an international soccer match. And then, we dress the entire country as well. But in the US, for whatever reason, Cinco de Mayo has become a day to celebrate anything and everything we love about Mexico, Mexicans and Mexican food. And thus, there are Mexican fiestas everywhere, Mariachi music playing on street corners, slushy margaritas of all kinds being poured in the middle of the afternoon, and people – be them Mexicans or not– dressing as Mexicans. And for that: we need to toast and celebrate! Any occasion to celebrate the beauty, the warmth, the richness of Mexican food and culture, the resilience of our people, is welcome by Mexicans everywhere. To help celebrate, here is my gift for you this Cinco: A crazy good Coco-Lime Margarita. 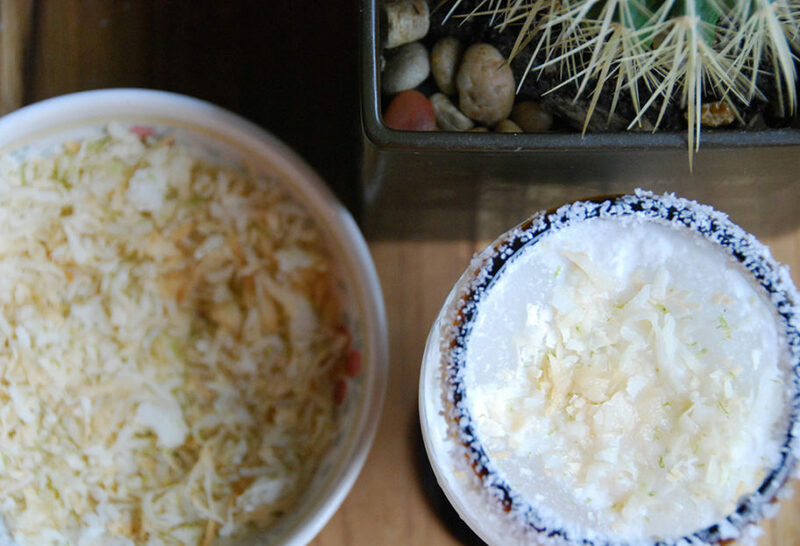 One that transports you to the beach where you can taste the salty sea breeze in the rim and munch on toasted sweetened coconut with a sprinkle of lime zest as you sip along a creamy and luscious Margarita. It is a very special one for me, too, because I developed it for my next cookbook, which I am working on. It is called “Mexican Today” and will be published by Houghton Mifflin Harcourt. I am thrilled to be working with my same editor, Rux Martin, and so very thankful she considered publishing my second cookbook. Please do look out for it! I am having so much fun with it and I know you will too. I am going wild in those pages… It will come out in 2016. Guess when? A month before Cinco! From this Mexican to you, with all my gratitude and love, I hope you enjoy this Margarita. Preheat the oven to 325 degrees. Spread the angel flakes on a small baking sheet, sprinkle with a pinch of salt and the lime zest, mix and spread again. Place in the oven and bake for 6 to 7 minutes, or until the coconut is just barely beginning to color. It should not brown. Remove from the oven and immediately transfer to a small bowl. Reserve. Pour some salt onto a small plate. Rub the rims of the glasses with the quartered lime, squeezing some of the juice over them. Then gently dip in the salt, coating all around the rims. Set aside. Combine the cream of coconut, tequila, orange liqueur and lime juice in a blender and puree until completely mixed and smooth. If making slushy style, add the 2 cups of ice and puree until almost smooth. Serve with the toasted flakes on top. If serving on the rocks, fill each glass with about 1/2 cup ice cubes and pour in the margarita mixture. Top with the coconut flakes. Me encanta tu show, y siempre lo veo con mi hija desde Papua New Guinea! Soy de Venezuela y tu cocinas tan sabroso que siempre hago tus recetas. Saludos y éxitos. This looks SO good! We watch your show with our three little girls daily if we can. So fun! I’m excited to try this recipe! ? Hope you love it Ivy! I just watched my first Patis show! Wow. Loved it. Now I can make the food that I love. Think that I may make the cheesecake too. Thanks !!! WOW! This blog is pretty cool and I love Mexicans food. The pictures of your recipe look very delicious, it attracts me. I also love your fresh and healthy recipes. Can’t wait to taste it and share it with my girlfriend.This is a nice service. Thanks for sharing your recipes. Excellent! Is their a “virgin” version? We are having a party at work and I thought to make a drink but not sure how this would taste w/out the tequila and triple sec. Any thoughts would be most welcome. !Gracias! This sounds so good and I will be making! Thank you!! Let me know what you think!